When No Pineapple Left Behind hit Kickstarter I was pretty darn excited. It looked like a very neat, satirical look at the U.S. school system via a strategy game where you teach classes full of pineapples. Unfortunately, by the end of the campaign they only managed to raise about half of the $35,000 goal. Luckily, the story didn’t end right then and there. Subaltern Games continued working on their project and even found themselves a publisher via Mastertronic. Thanks to these fortunate events, No Pineapple Left Behind has not been, well, left behind by the developer. Would you like to take it for a spin? Now you can! 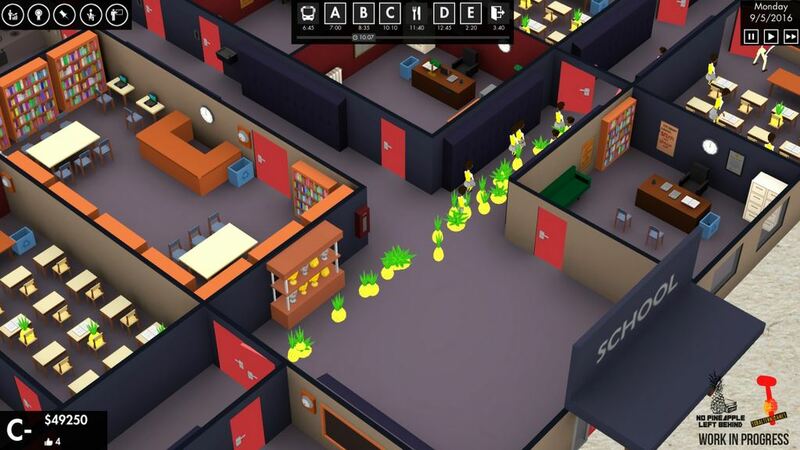 No Pineapple Left Behind now has an alpha build available on itch.io. It’s available on a pay what you want basis, meaning you can totally download it for Windows, Mac, or Linux free of charge. Of course, if you’d like to help the developers out then you probably should consider tossing a buck or two their way for the download.